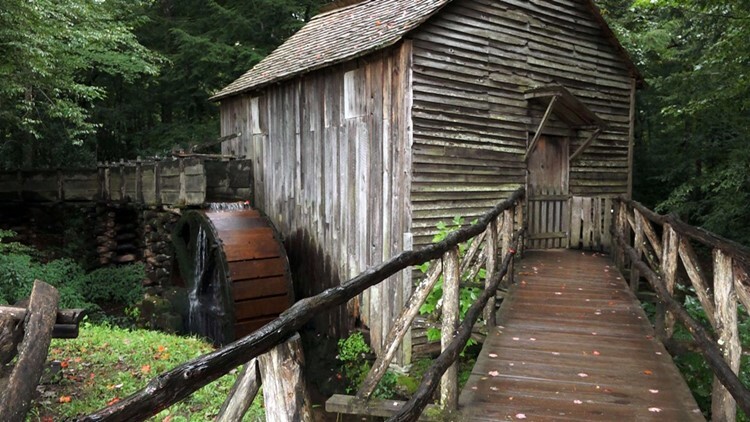 Great Smoky Mountains — The historic grist mill built by John P. Cable in the 1870s remains a centerpiece for visitors to Cades Cove in the Great Smoky Mountains. But what happens when the huge water wheel is worn out? "They definitely wear out over time and start to rot," said Delayne Hodges, a historic preservation expert for Great Smoky Mountains. "When they first built these mills, you had people who made wheels and kept them stacked in barns. They would have to swap the wheels out every 7 to 10 years, just like changing your tires on your car." Delayne Hodges stands with the new water wheel he built for the Cable Mill in Cades Cove in the Great Smoky Mountains. 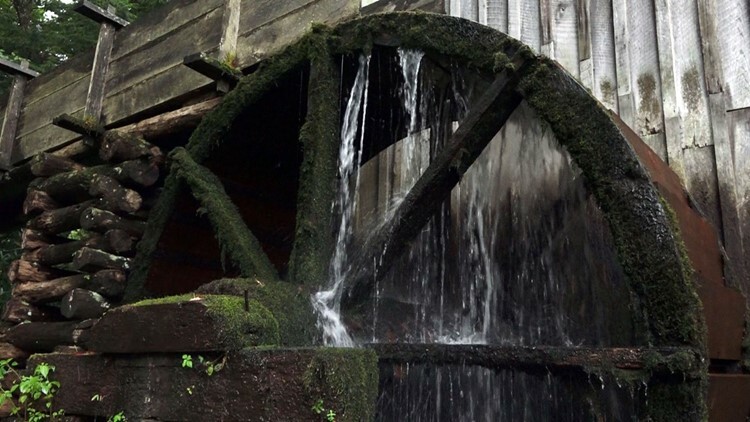 These days, there are no barns loaded with spare water wheels for an 1870s grist mill. You also cannot swing by the hardware store and buy a replacement. Hodges and other workers in the Historic Preservation Workshop in the Great Smoky Mountains had to rebuild the wheel from scratch. "I have made many wheels, but not this big," said Hodges. "It is 10 feet 9.5 inches in diameter. I took the best measurements you can off the old wheel, draw it out on a piece of paper, and then come back and draw it out here [in the workshop] to size." Hodges says it took a couple of weeks to draft the wheel and calculate all the materials needed to build a replacement. Then it took an additional two weeks to cut and shape the white oak lumber into a new water wheel. The locally-milled white oak lumber and hardware for the wheel cost $7,400. The historic Cable Mill in Cades Cove in the Great Smoky Mountains. "White oak is indigenous to the area and it's what would have been used to make these wheels because it is very resistant to water. That's why this kind of wood was also used to make ships," said Hodges. Now that the wheel is ready, crews are not going to simply old for new. The park will remove the old wheel and then spend a couple of weeks improving the water flow and drainage at the mill. Water currently pools at the bottom of the old wheel, making it difficult to spin and eroding the wheel faster than usual. The Cable Mill is one of the only overshot wheels in the park, meaning the water flows over the top of the water wheel. The water wheels can last 15 to 20 years before being replaced. The current wheel was installed in 2000. When the time comes to build the next one, Hodges says workers will not have to reinvent the wheel. The old water wheel set to be replaced at the historic Cable Mill in Cades Cove in the Great Smoky Mountains. "I drew up blueprints for this wheel because the park never had any. So, the next time they will have prints to go by," said Hodges. 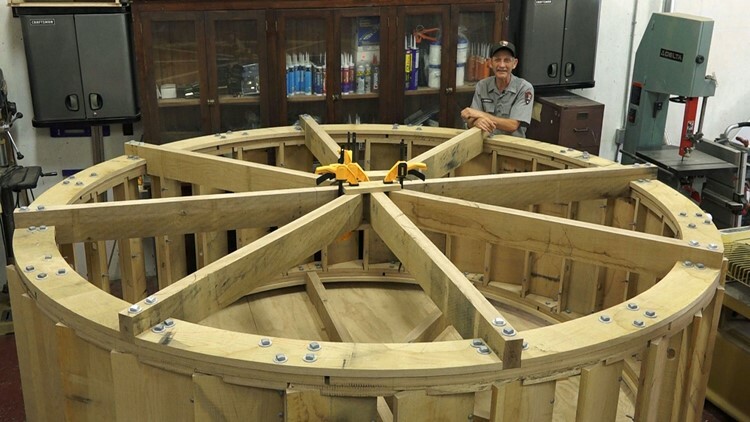 The new water wheel should be up and running in early-September. For Hodges, the chance to keep the wheels of history spinning the Smokies is a reward of the job. "I think it is important to keep history. It makes it unique and fun. It's not run-of-the-mill type of stuff," said Hodges, with no pun intended.